As the demand for sit to stand products continues to increase, office furniture manufacturers are hard at work looking for ways to raise the bar. 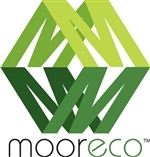 While most fail to deliver truly innovative products, the team at MooreCo has found success with hot new lines like Nido. 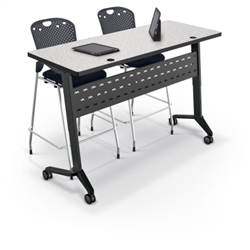 This collection of collaborative training tables provides exceptional versatility, functionality, and appeal. Let's take an in-depth at the sit to stand tables from this awesome line today on the OFD blog. In group areas like the training room, your office furniture needs to be ready, willing, and able to adapt at a moments notice to meet the needs of any specific task. That's where the Nido line comes in. 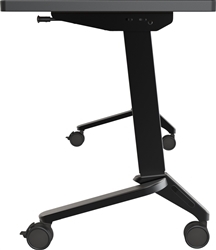 While training room tables are a dime-a-dozen in 2017, not all offer the sit to stand capabilities of this collection. 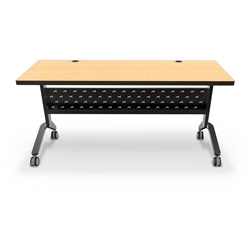 Nido tables can be used effectively in training, conference, and classroom settings to reduce energy dips, improve posture, and spark creativity. These multi purpose sit to stand tables are available in a variety of designer finish options and sizes to meet your specific needs. 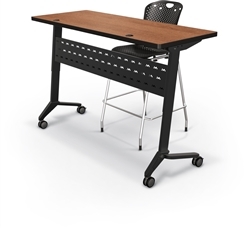 The MooreCo training room tables from the Nido line feature 1" thick tops that can be easily flipped down. This makes them easy to nest along perimeter walls to maximize your available square footage when all your tables aren't needed at the same time. The laminate operating surfaces are also scratch resistant and easy to clean to provide long term durability. Heavy duty table bases are equipped with 3" dual wheel casters that can be locked to prevent unnecessary rolling around. While this seems minor, it's detail you don't want to overlook when selecting tables for the training room and collaborative work environments. 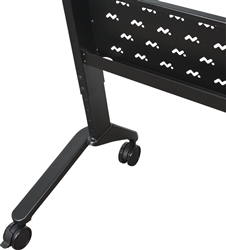 The powder-coated steel frame that comes standard on all Nido models includes a stabilizing stretcher bar. The perforated modesty panel provides privacy and lends to additional structural stability. As we've mentioned, what really sets the Nido collection apart are its sit to stand capabilities. As working for long periods of time for the seated position can have damaging health affects, the ability to work and collaborative standing up is incredibly beneficial. Nido series height adjustable office table surfaces can be raised up to 41.75" and lowered to 29.5" which is considered to be standard "desk height". You'll want to pair the tables from this collection with height adjustable seating that's ready to transition between sit-down and stand-up positions. 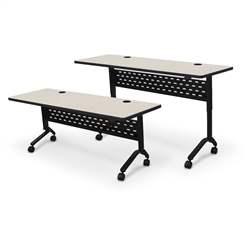 Nido tables work great with ergonomic drafting chairs and height adjustable office stools like the Up-Rite 34796 from MooreCo. As an added bonus, these tables are Greenguard Gold Certified. If you're looking to create eco friendly office interiors, Nido has you covered! In all honesty, Nido is probably the most versatile training room furniture collection on the market. Nido tables can support up to 300 pounds and provide an unrivaled combination of quality, appeal, and operational functionality. You simply can't go wrong with Nido in your professional work environments. Tables are available starting at $405.99.